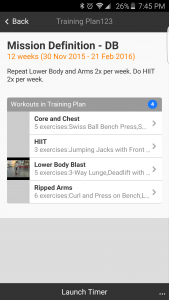 Your custom personalized workout plans await! Schedule your 10 minute phone call with me. I’ll create your own personalized workout plans for 3 months, 6 months, or a year. This isn’t cookie cutter fitness! It’s tailored to your needs and present fitness level. I’ll meet with you in person or by web to give you a free 1 hour transformation session where we discuss your health history, workout experience, and I learn about your overall well-being. We discuss your specific goals. From then, I’ll create your own custom workout program. You’ll have access to your workouts via mobile app, and you will be able to contact me via the app with any questions. No gym membership required. As long as you have some space at home, I will create your workout program. If you have your own equipment at home, I’ll incorporate what you have into your program. Programs can include body weight training (plyometrics), light or heavy dumbbells, resistance bands, kettlebells, swiss balls, medicine balls, and more. If you have a gym membership, I’ll show you how to get maximum use of the equipment available to you so you can reach your fitness goals. I’ll schedule all your workouts for the duration of your workout plan, and you and I will track your progress every 4 weeks. You’ll have access to all your training online. I’ll hold you accountable by reminding you of what’s on your calendar by email. You’ll also be able to chat with me or email me via the fitness app. We’ll track your fitness progress online! All of this is graphed out for you, so you can see the progress you make. To get started, schedule your 10 minute phone call with me.